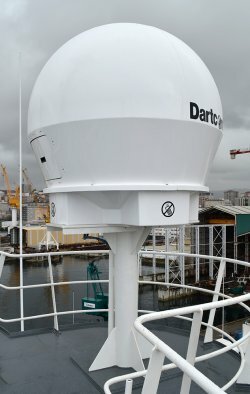 Dartcom has launched a 1.5m marine antenna option for the X-Band EOS and HRPT/AHRPT Systems. It uses the X/Y stabilised platform from Dartcom’s proven 1.3m marine antenna, installed on numerous vessels worldwide, including all of the British Antarctic Survey’s research ships. The 1.5m dish, RF components and low-loss composite radome are from Dartcom’s land-based X-Band EOS antenna, the first of which was installed in April 2014 at LATUV, Spain, and has been proven as exceptionally capable and reliable. The 1.5m marine antenna has been designed to provide an easy and cost-effective future upgrade path to receive the next generation of earth observation satellites as well as the current Terra, Aqua, Suomi-NPP, JPSS-1 and FY-3 A/B/C X-Band direct broadcast downlinks. It means L-Band HRPT/AHRPT systems can be upgraded to receive X-Band EOS data at a later date.